We recently found the “Automatic Virus Scanner” (ggg.tools.anti01), an Antivirus app with 100k-500k downloads on Google Play, was actually a “placebo” – in other words, it has no functionality on protection at all. First time using it? 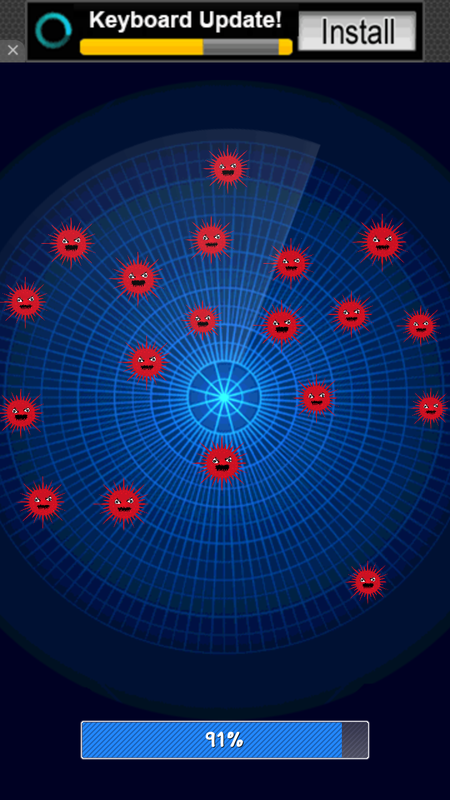 You will be scared by finding so many “red viruses” in your phone. After clicked the “clean” button, it will start “bombing” the viruses. And if you scan again, it will show the clean result. Looks real huh? Let’s find out what’s going wrong! The code (developed in C# in Unity framework) for “scan” logic will read several values from a local XML file, which contains the “last scanned date” (“y”, “m” and “d” value) and “whether the user scanned before” (“f”) value. If the user has not scanned before or the last scanning has passed for 3 days, it will play the “red virus” animation and display “virus detected”. Otherwise, display “no virus”. The local XML file, the only basis for showing positive result or not. It stores the time point that the app “should” detect virus. The “f” value indicates whether the user has clicked “clean virus” before. If you delete this file, you will find it always detects virus. Also, due to our dynamic analysis sandbox, only the statistics and ADs URL has been visited when using this app. No backend is found. Nor did it access any local apks during the scanning. Statistics and Ads are accessed, but no backend is found. It writes a config file, but no local apk file is accessed. How could it “scan”? It seems this app only delivers a “sense of security” rather than solid protection.